He married Princess Alice of Hesse, who converted to Orthodoxy from Protestantism and took the name Alexandra. Their children were Olga (1895), Tatiana (1897), Maria (1899), Anastasia (1901), and Alexis (1904). Saint Nicholas was executed by the Bolsheviks at Ekaterinburg on July 4/17, 1918 along with his family and servants. The prisoners were awakened late at night and ordered to get dressed for travel. They went down to the cellar of the home in which they were being held, waiting for the word to leave. 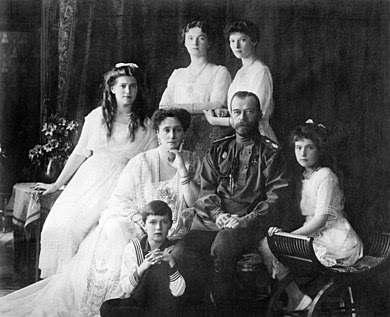 The Tsar sat on a chair in the middle of the room holding his son Alexis in his lap, while his wife and daughters stood around them. The Moscow Patriarchate ultimately canonized the family as passion bearers: people who face death with resignation, in a Christ-like manner, as distinguished from martyrs, the latter killed explicitly for their faith. Despite their official designation as "passion-bearers" by the August 2000 Council, they are nevertheless spoken of as "martyrs" in Church publications, icons, and in popular veneration by the people. 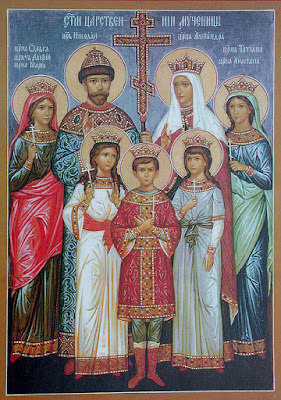 The bodies of Tsar Nicholas II, Tsarina Alexandra, and three of their daughters were finally interred at Saint Peter and Paul Cathedral in St. Petersburg on 17 July 1998, eighty years after they were murdered. The bodies of Alexei and one of his sisters were at the time missing. On 23 August 2007, a Russian archaeologist announced the discovery of two burned, partial skeletons at a bonfire site at Ganina Yama near Yekaterinburg that appeared to match the site described in assassin Yakov Yurovsky's memoirs. The archaeologists said the bones are from a boy who was roughly between the ages of ten and thirteen years at the time of his death and of a young woman who was roughly between the ages of eighteen and twenty-three years old. Anastasia was seventeen years, one month old at the time of the assassination, while her sister Maria was nineteen years, one month old and her brother Alexei was two weeks shy of his fourteenth birthday. Anastasia's elder sisters Olga and Tatiana were twenty-two and twenty-one years old at the time of the assassination. Along with the remains of the two bodies, archaeologists found "shards of a container of sulfuric acid, nails, metal strips from a wooden box, and bullets of various caliber." Preliminary testing indicated a "high degree of probability" that the remains belong to the Tsarevich Alexei and to one of his sisters, Russian forensic scientists announced on 22 January 2008. The Yekaterinburg region's chief forensic expert Nikolai Nevolin indicated the results would be compared against those obtained by foreign experts. On April 30, 2008, Russian forensic scientists announced that DNA testing proves that the remains belong to the Tsarevich Alexei and to one of his sisters. With this result, all of the Tsar's family are accounted for. Most noble and sublime was your life and death, O Sovereigns; wise Nicholas and blest Alexandra, we praise you, acclaiming your piety, meekness, faith, and humility, whereby you attained to crowns of glory in Christ our God, with your five renowned and godly children of blessed fame. O passion-bearers decked in purple, intercede for us. 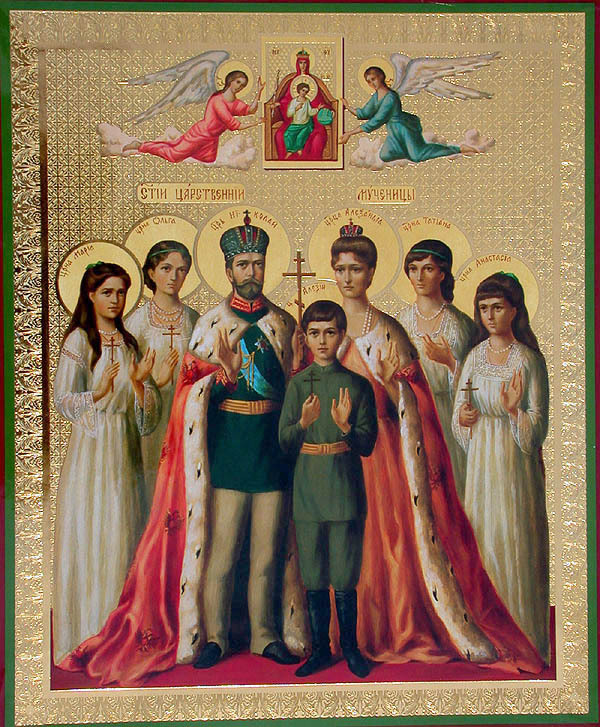 Royalty and martyrdom were joined together, O blessed ones, in your death for righteousness and right belief, O wise Sovereigns, Nicholas and Alexandra, with your five children. Hence, Christ our God counted you worthy of thrones in Heaven; and with twofold crowns of glory, you reign forever, adorned with grace divine.